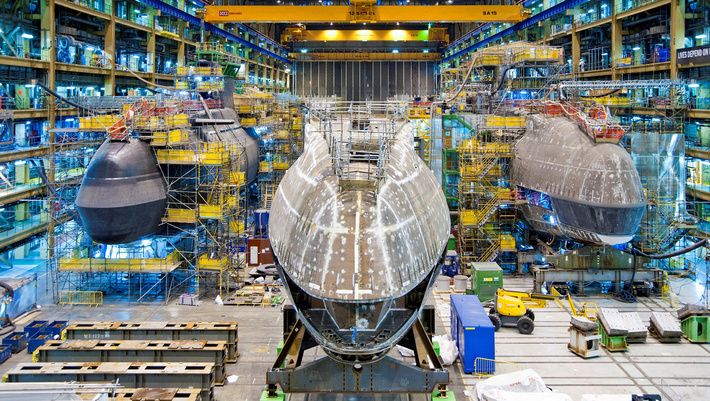 Defence and aerospace giant BAE Systems has been handed a A$2.7 billion contract by the UK Ministry of Defence for the delivery of the fifth Astute class submarine. According to BAE, the contract is for the design, test and commissioning activities on Anson nuclear-powered submarine, which is in construction phase since 2010 and is expected to leave for sea trials in 2020. “Signing this contract is an important milestone in the Astute programme. This is a hugely complex national endeavour and we are proud of the role we play in helping to protect our nation’s interests,” said Tony Johns, Managing Director of BAE Systems Submarines. The investment was announced last week by the Minister for Defence Procurement, Philip Dunne during a visit to BAE. “This £1.3 billion contract marks an important step in the progress of the Astute programme. This is a key part of our £166 billion plan to ensure that our armed forces have the equipment they need to defend the UK’s interests across the seas, in the skies and on land, both at home and abroad,” Mr Dunne said. The Anson is being built at BAE System’s Barrow-in-Furness, Cumbria site, where the company is also working on the development of boat six Agamemnon and the “yet-to-be named” seventh submarine. “This new contract for Anson not only provides significant financial savings of £50 million to the taxpayer but also secures thousands of jobs in Barrow and across the UK supply chain, demonstrating the Government’s commitment to increase defence spending each year for the rest of the decade,” the Minister added. The nuclear-powered Astute class submarines are equipped with land strike, strategic intelligence-gathering, anti-submarine and surface ship warfare capabilities, providing the Royal Navy with tactical advantage over its maritime rivals.